In my previous post, I was writting about how to graph temperature and humidity from AM2302 sensor on RasberryPi. 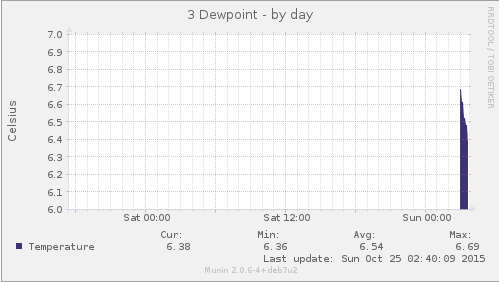 In addition, we will add dewpoint monitoring. We need two variables to calculate dewpoint, temperature and humidity. I took some already made scripts and combined them together to fit my needs. I wanted to calculate dewpoint completely with bash and bc, but since I’m to lazy, I just used the python script from this blog.